The Iraqi Army, officially the Iraqi Ground Forces, is the ground force component of the Iraqi Armed Forces, having been active in various incarnations throughout the 20th and 21st centuries. It was known as the Royal Iraqi Army up until the coup of July 1958. Al-firka Al-thahabia "The golden divisions"
The Iraqi Army in its modern form was first created by the United Kingdom during the inter-war period of de facto British control of Mandatory Iraq. Following the invasion of Iraq by U.S. forces in 2003, the Iraqi Army was rebuilt along American lines with enormous amounts of U.S. military assistance at every level. Because of the Iraqi insurgency that began shortly after the invasion, the Iraqi Army was later designed to initially be a counter-insurgency force. With the withdrawal of U.S. troops in 2011, Iraqi forces have assumed full responsibility for their own security. A New York Times article suggested that, between 2004 and 2014, the U.S. had provided the Iraqi Army with $25 billion in training and equipment in addition to an even larger sum from the Iraqi treasury. The Army extensively collaborated with Iraqi Popular Mobilization Forces during anti-ISIL operations. The threat of war with newly forming Republic of Turkey, which claimed the Ottoman vilayet of Mosul as part of their country, led the British to form the Iraqi Army on 6 January 1921. The Mussa Al-Kadhum Brigade consisted of ex-Iraqi-Ottoman officers, whose barracks were located in Kadhimyah. The United Kingdom provided support and training to the Iraqi Army and the Iraqi Air Force through a small military mission based in Baghdad. Iraqi Army Day celebrates the soldiers that fight for Iraq. From 1533 to 1918, Iraq was under the rule of the Ottoman Empire, and fought as part of the Military of the Ottoman Empire. After 1917, the United Kingdom took control of the country. The first Iraqi military forces established by the British were the Iraq Levies, several battalions of troops tasked to guard the Royal Air Force (RAF) bases from which the British controlled Iraq. In August 1921, the British installed Hashemite King Faisal I as the client ruler of the British Mandate of Iraq. Faisal had been forced out as the King of Syria by the French. Likewise, British authorities selected Sunni Arab elites from the region for appointments to government and ministry offices in Iraq. The British and the Iraqis formalized the relationship between the two nations with the Anglo-Iraqi Treaty of 1922. With Faisal's ascension to the throne, the Iraqi Army became the Royal Iraqi Army (RIrA). In 1922, the army totalled 3,618 men. This was well below the 6,000 men requested by the Iraqi monarchy and even less than the British set limit of 4,500. Unattractive salaries hindered early recruiting efforts. At this time, the United Kingdom maintained the right to levy local forces like the British-officered Iraq Levies which were under direct British control. With a strength of 4,984 men, the Iraq Levies outnumbered the army with its British set limit of 4,500 men. In 1924, the army grew to 5,772 men and, by the following year, had grown still more to reach 7,500 men. It was to stay at 7,500 men until 1933. The force now had six infantry battalions, three cavalry regiments, two mountain regiments, and one field battery. In 1932, the Kingdom of Iraq was granted official independence. This was in accordance with the Anglo-Iraqi Treaty of 1930, whereby the United Kingdom would end its official mandate on the condition that the Iraqi government would allow British advisers to take part in government affairs, allow British military bases to remain, and a requirement that Iraq assist the United Kingdom in wartime. Upon achieving independence in 1932, political tensions arose over the continued British presence in Iraq, with Iraq's government and politicians split between those considered pro-British and those who were considered anti-British. The pro-British faction was represented by politicians such as Nuri as-Said who did not oppose a continued British presence. The anti-British faction was represented by politicians such as Rashid Ali al-Gaylani who demanded that remaining British influence in the country be removed. In 1936, General Bakr Sidqi, who had won a reputation from suppressing tribal revolts, was named Chief of the General Staff and successfully pressured the King to demand that the Cabinet resign. From that year to 1941, five coups by the RIrA occurred during each year led by the chief officers of the army against the government to pressure the government to concede to Army demands. In early April 1941, during World War II, Rashid Ali al-Gaylani and members of the anti-British "Golden Square" launched a coup d'état against the current government. Prime Minister Taha al-Hashimi resigned and Rashid Ali al-Gaylani took his place as Prime Minister. Rashid Ali also proclaimed himself chief of a "National Defence Government." He did not overthrow the monarchy, but installed a more compliant Regent. He also attempted to restrict the rights of the British which were granted them under the 1930 treaty. On April 30 Iraqi Army units took the high ground to the south of RAF Habbaniya. An Iraqi envoy was sent to demand that no movements, either ground or air, were to take place from the base. The British refused the demand and then themselves demanded that the Iraqi units leave the area at once. In addition, the British landed forces at Basra and the Iraqis demanded that these forces be removed. At 0500 hours on 2 May 1941, the Anglo-Iraqi War broke out between the British and Rashid Ali's new government when the British at RAF Habbaniya launched air strikes against the Iraqis. By this time, the army had grown significantly. It had four infantry divisions with some 60,000 men. At full strength, each division had three brigades. The Iraqi 1st and 3rd Divisions were stationed in Baghdad. Also based within Baghdad was the Independent Mechanized Brigade comprising a L3/35 light tank company, an armoured car company, two battalions of "mechanized" infantry transported in trucks, a "mechanized" machine-gun company, and a "mechanized" artillery brigade. The 2nd Division was stationed in Kirkuk, and the 4th Division was in Al Diwaniyah, on the main rail line from Baghdad to Basra. All these "mechanized" infantry units were transported by trucks. Hostilities between the British and the Iraqis lasted from 2 May to 30 May 1941. The German government despatched an aviation unit, Fliegerführer Irak, and Italy send limited assistance, but both were too late and far from adequate. In the end, the British were able to march on Baghdad and Rashid Ali al-Gaylani fled. After the Anglo-Iraqi War ended, Nuri as-Said returned as Prime Minister and dominated the politics of Iraq until the overthrow of the monarchy and his assassination in 1958. Nuri as-Said pursued a largely pro-western policy during this period. The army was not disbanded. Instead, it was maintained to hinder possible German offensive actions launched from southern Russia. British troops left in the late 1940s. In the 1948 Arab–Israeli War, the Iraqis deployed an expeditionary force which peaked at 15,000–18,000 men. In 1948, the RIrA deployed 21,000 men in twelve brigades and the Royal Iraqi Air Force deployed 100 planes, mostly British. Initially the Iraqis committed around 3,000 men to the war effort including four infantry brigades, one armoured battalion and support personnel. These forces were to operate under Jordanian guidance During the first truce the Iraqis increased their force to about 10,000. Ultimately, the Iraqi expeditionary force numbered around 15,000 to 18,000 men. The first Iraqi forces to be deployed reached Jordan in April 1948 under the command of General Nur ad-Din Mahmud. On 15 May, Iraqi engineers built a pontoon bridge across the Jordan River and attacked the Israeli settlement of Gesher. Over 3,000 Iraqi soldiers with armor and air support were unable to defeat less than 50 lightly armed Jewish defenders. Following this defeat Iraqi forces moved into the Nablus–Jenin–Tulkarm strategic triangle, where they suffered heavy casualties in the Israeli attack on Jenin which began on 3 June, but they managed to hold on to their positions. Active Iraqi involvement in the war effectively ended at this point. In May 1955 the British finally withdrew from Iraq. The Iraqi authorities said during the withdrawal negotiations that a motorised infantry brigade was to be formed, based at the previous RAF Habbaniya, a location that had been occupied by the British Iraq Levies. The Hashemite monarchy lasted until 1958, when it was overthrown through a coup d'état by the Iraqi Army, known as the 14 July Revolution. King Faisal II of Iraq along with members of the royal family were murdered. The coup brought Abd al-Karim Qasim to power. He withdrew from the Baghdad Pact and established friendly relations with the Soviet Union. When Qāsim distanced himself from Abd an-Nāsir, he faced growing opposition from pro-Egypt officers in the Iraqi army. `Arif, who wanted closer cooperation with Egypt, was stripped of his responsibilities and thrown in prison. When the garrison in Mosul rebelled against Qāsim's policies, he allowed the Kurdish leader Barzānī to return from exile in the Soviet Union to help suppress the pro-Nāsir rebels. The creation of the new Fifth Division, consisting of mechanized infantry, was announced on 6 January 1959, Army Day. Qāsim was also promoted to the rank of general. In 1961, an Army buildup close to Kuwait in conjunction with Iraqi claims over the small neighbouring state, led to a crisis with British military forces (land, sea, and air) deployed to Kuwait for a period. In 1961, Kuwait gained independence from Britain and Iraq claimed sovereignty over Kuwait. As in the 1930s, Qasim based Iraq's claim on the assertion that Kuwait had been a district of the Ottoman province of Basra, unjustly severed by the British from the main body of Iraqi state when it had been created in the 1920s. Britain reacted strongly to Iraq's claim and sent troops to Kuwait to deter Iraq. Qāsim was forced to back down and in October 1963, Iraq recognized the sovereignty of Kuwait. Qāsim was assassinated in February 1963, when the Ba'ath Party took power under the leadership of General Ahmed Hasan al-Bakr (prime minister) and Colonel Abdul Salam Arif (president). Nine months later `Abd as-Salam Muhammad `Arif led a successful coup against the Ba'ath government. On 13 April 1966, President Abdul Salam Arif died in a helicopter crash and was succeeded by his brother, General Abdul Rahman Arif. Following the Six-Day War of 1967, the Ba'ath Party felt strong enough to retake power (17 July 1968). Ahmad Hasan al-Bakr became president and chairman of the Revolutionary Command Council (RCC). 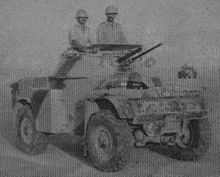 Iraqi Army Panhard AML-60 armored car, 1970s. Iraq ordered about 250 of these vehicles between 1968 and 1976. During the Six-Day War, the Iraqi 3rd Armoured Division was deployed in eastern Jordan. However, the Israeli attack against the West Bank unfolded so quickly that the Iraqi force could not organise itself and reach the front before Jordan ceased fighting. Repeated Israeli airstrikes also held them up so that by the time they did reach the Jordan River the entire West Bank was in Israeli hands. During the course of the Jordanian Campaign ten Iraqis were killed and 30 Iraqis were wounded, especially as the main battle was in Jerusalem. Fighting also raged in other areas of the West Bank, where Iraqi commandos and Jordanian soldiers defended their positions. Barzānī and the Kurds who had begun a rebellion in 1961 were still causing problems in 1969. The secretary-general of the Ba`th party, Saddam Hussein, was given responsibility to find a solution. It was clear that it was impossible to defeat the Kurds by military means and in 1970 a political agreement was reached between the rebels and the Iraqi government. Following the Arab defeat in 1967, Jordan became a hotbed of Palestinian activity. During this time PLO elements attempted to create a Palestinian state within Jordan caused the Jordanians to launch their full military force against the PLO. As they were doing this Syria invaded Jordan and Iraq moved a brigade in Rihab, Jordan. Otherwise the only Iraqi activity was that they fired upon some Jordanian aircraft. Iraq sent a 60,000 man expeditionary force to the Syrian front during the Yom Kippur War. It consisted of the 3rd and 6th Armoured Divisions, two infantry brigades, twelve artillery battalions, and a special forces brigade. The two armoured divisions were, Pollack says, 'unquestionably the best formations of the Iraqi Army. '(Pollack p. 167) Yet during their operations on the Golan Heights, their performance was awful in virtually every category of military effectiveness. Military intelligence, initiative, and small unit independent action was virtually absent. Later, Saddam Hussein, looking to build fighting power against Iran soon after the outbreak of the Iran–Iraq War doubled the size of the Iraqi army from 1981, when it numbered 200,000 soldiers in 12 divisions and 3 independent brigades, to 1985, when it had 500,000 men in 23 divisions and nine brigades. The first new divisions were created in 1981 when the 11th and 12th Border Guard Divisions were converted into infantry formations and the 14th Infantry Division was formed. Yet the rise in number of divisions is misleading, because during the war Iraqi divisions abandoned a standard organisation with permanent ('organic') brigades assigned to each division. Instead division headquarters were assigned a mission or sector and then assigned brigades to carry out the task - up to eight to ten brigades on some occasions. The war came at a great cost in lives and economic damage - a half a million Iraqi and Iranian soldiers as well as civilians are believed to have died in the war with many more injured and wounded - but brought neither reparations nor change in borders. The conflict is often compared to World War I, in that the tactics used closely mirrored those of the 1914–1918 war, including large scale trench warfare, manned machine-gun posts, bayonet charges, use of barbed wire across trenches and on no-mans land, human wave attacks by Iran, and Iraq's extensive use of chemical weapons (such as mustard gas) against Iranian troops and civilians as well as Iraqi Kurds. By the eve of the Invasion of Kuwait which led to the 1991 Persian Gulf War, the army was estimated to number 1,000,000 men. Just before the Persian Gulf War began, the force comprised 47 infantry divisions plus 9 armoured and mechanised divisions, grouped in 7 corps. This gave a total of about 56 army divisions, and total land force divisions reached 68 when the 12 Iraqi Republican Guard divisions were included. Although it was said at the time in Western media[which?] that Iraqi troops numbered approximately 545,000 (even 600,000) today most experts[which?] think that both the qualitative and quantitative descriptions of the Iraqi army at the time were exaggerated, as they included both temporary and auxiliary support elements. Many[quantify] of the Iraqi troops were also young, under-resourced and poorly trained conscripts. Saddam did not trust the army; among counterbalancing security forces was the Iraqi Popular Army. The wide range of suppliers of Iraqi equipment resulted in a lack of standardization in this large heterogeneous force. It additionally suffered from poor training and poor motivation. The majority of Iraqi armoured forces still used old Chinese Type 59s and Type 69s, Soviet-made T-55s from the 1950s and 1960s, and some T-72s from the 1970s in 1991. These machines were not equipped with up-to-date equipment, such as thermal sights or laser rangefinders, and their effectiveness in modern combat was very limited. The Iraqis failed to find an effective countermeasure to the thermal sights and the sabot rounds used by the M1 Abrams, Challenger 1 and the other Coalition tanks. This equipment enabled Coalition M1A1s to effectively engage and destroy Iraqi tanks from well outside the distance (eg 8,200 ft to Iraqi ranges of 6,600 ft) that Iraqi tanks could engage. The Iraqi tank crews used old, cheap steel penetrators[which?] against the advanced Chobham Armour of these US and British tanks, with disastrous results[clarification needed]. The Iraqi forces also failed to utilize the advantage that could be gained from using urban warfare — fighting within Kuwait City — which could have inflicted significant casualties on the attacking forces. Urban combat reduces the range at which fighting occurs and can negate some of the technological advantage that well equipped forces enjoy. Iraqis also tried to use Soviet military doctrine, but the implementation failed due to the lack of skill of their commanders and the preventive air strikes of the USAF and RAF on communication centers and bunkers. While the exact number of Iraqi combat casualties has yet to be firmly determined, sources agree that the losses were substantial. Immediate estimates said up to 100,000 Iraqis were killed. More recent estimates indicate that Iraq probably sustained between 20,000 and 35,000 fatalities, though other figures still maintain fatalities could have been as high as 200,000. A report commissioned by the U.S. Air Force, estimated 10,000-12,000 Iraqi combat deaths in the air campaign and as many as 10,000 casualties in the ground war. This analysis is based on Iraqi prisoner of war reports. It is known[by whom?] that between 20,000 and 200,000 Iraqi soldiers were killed. According to the Project on Defense Alternatives study, 3,664 Iraqi civilians and between 20,000 and 26,000 military personnel were killed in the conflict. 75,000 Iraqi soldiers were wounded in the fighting. The International Institute for Strategic Studies (IISS) estimated the army's composition immediately after the 1991 War as 6 'armoured'/'mechanised' divisions, 23 infantry divisions, 8 Republican Guard divisions and four Republican Guard internal security divisions. Jane's Defence Weekly for 18 July 1992 stated that 10,000 troops from 5 divisions were fighting against Shia Muslims in the southern marshlands. The IISS gave the Iraqi Army's force structure as of 1 July 1997 as seven Corps headquarters, six armoured or mechanised divisions, 12 infantry divisions, 6 RGF divisions, four Special Republican Guard Brigades, 10 commando, and two Special Forces Brigades. It was estimated to number 350,000 personnel, including 100,000 recently recalled reservists. In the days leading up to the 2003 invasion of Iraq and the following Iraq War, the army consisted of 375,000 troops, organized into five corps. In all, there were 11 infantry divisions, 3 mechanized divisions, and 3 armored divisions. The Republican Guard consisted of between 50,000 and 60,000 troops (although some sources indicate a strength of up to 80,000). 1st Corps, near Kirkuk consisted of the 5th Mechanized Division, 2nd Infantry Division, 8th Infantry Division and the 38th Infantry Division. 2nd Corps, near Diyala, had the 3rd Armored Division, 15th Infantry Division, and 34th Infantry Division. 3rd Corps, near An Nasiriyah, had the 6th Armored Division, the 51st Mechanized Division, and the 11th Infantry Division. 4th Corps, near Amarah, included the 10th Armored Division, 14th Infantry Division and 18th Infantry Division. 5th Corps, near Mosul, had the 1st Mechanised Division, and the 4th, 7th, and 16th Infantry Divisions. Western Desert Force, consisting of an armored infantry division and other units in western Iraq. Malovany's description of deployments generally follows this pattern, with the exception of the Western Desert Force, which he does not mention in any way. During the 2003 invasion of Iraq the Iraqi Army was defeated in a number of battles, including by Task Force Viking in the north, and the Battle of Nasiriyah and the Battle of Baghdad. The Iraqi Army was disbanded by Coalition Provisional Authority Order Number 2 issued by U.S. Administrator of Iraq Paul Bremer on May 23, 2003 after its decisive defeat. Bremer said that it was not feasible to reconstitute the armed forces. His justifications for the disbandment included postwar looting, which had destroyed all the bases; that the largely Shiite draftees of the army would not respond to a recall plea from their former commanders, who were primarily Sunnis, and that recalling the army would be a political disaster because to the vast majority of Iraqis it was a symbol of the old Baathist-led Sunni ascendancy..."
1st Corps – established before Iran-Iraq War. 3rd Corps – established before Iran-Iraq War. In 2003, Nasiriyah was the headquarters of the Iraqi Army's 3rd Corps, composed of the 11th ID, 51st Mech ID, and 6th Armored Division—all at around 50 percent strength. The 51st operated south covering the oilfields, and the 6th was north near Al Amarah, which left three brigade-sized elements of the 11th ID to guard the An Nasiriyah area. 4th Corps – established 22 October 1981 to take over the northern sector of Khuzestan Province, including Basitin, Shush, and Dezful sectors. Maj Gen Hisham Sahab al-Fakhri, previously 10th Armoured Division commander, was appointed as the corps commander. 1st Mechanised, 10th Armoured, and 14th Infantry Division were allocated to the corps, leaving 3rd Corps with 3rd and 9th Armoured, 5th Mechanised, and 11th Infantry Divisions. 6th Corps – Malovany 2017 writes that on 25 March 1985, a army meeting chaired by Saddam in Baghdad decided to transform the East Tigris Headquarters into a regular corps, the 6th Corps. It was to be reinforced with four additional divisions; as the 35th Division had been transferred to the 4th Corps, and the 32nd Division was with the East Tigris HQ, the new line-up would consist of the 32nd Division as before; the 12th Armoured Division and 2nd Infantry Division transferred both from the 2nd Corps; the 4th Infantry Division, and the 25th Infantry Division from the 4th Corps. Malovany adds on the same page that during 1986 two more divisions joined the 6th Corps, an infantry division ("apparently the 50th") and the "Marshes" Division. 1st Division, active from at least 1941. 1st Mechanised Division in Persian Gulf War and Iraq War. Reformed after 2003. 4th Division, active from at least 1941. As 4th Mountain Infantry Division, served in Iran–Iraq War. 5th Division, activated 1959. Served in Iran–Iraq War. As 5th Mechanised Division, fought in Battle of Khafji. 8th Division. As 8th Mountain Infantry Division, served in Iran–Iraq War. Eisenstadt reported 'about eight infantry divisions remain unaccounted for' as of March 1993. 9th Armoured Division, served in Iran–Iraq War, disbanded after First Battle of Basrah/Operation Ramadan, July 1982 (Pollack p. 205). Reformed after 2003. Based on Bush administration expectations that coalition forces would be welcomed as liberators after the overthrow of the Hussein regime, prewar planners had only been expecting little if any resistance from the Iraqi people. Thus the new army was initially focused on external defence operations. The new Army was originally intended to comprise 27 battalions in three divisions numbering 40,000 soldiers in three years time. Vinnell Corporation was engaged to train the first nine battalions. The Coalition Military Assistance Training Team (CMATT), headed by Major General Paul Eaton, was the organization set up by the Department of Defense with the responsibility of training and development of the new army. On August 2, 2003, the first battalion of new Iraqi Army recruits started a nine-week training course at a training base in Qaraqosh. They graduated on October 4, 2003. In the interim, the new army had been formally established by Coalition Provisional Authority Order 22 of August 7, 2003. In April 2004, several Iraqi battalions refused to fight as part of the force engaged in the First Battle of Fallujah. The Fifth Battalion was among the new Iraqi units that fought in Fallujah. In June 2004, the CMATT was dissolved, and passed on its responsibilities to the Multi-National Security Transition Command – Iraq (MNSTC-I) (initially headed by Lt. Gen. David Petraeus) with the new focus on providing security for the Iraqi people from the emerging threat posed by the Iraqi insurgency. While the regular army was being formed, U.S. commanders around the country needed additional troops more quickly, and thus the Iraqi Civil Defense Corps (which became the Iraqi National Guard by July 2004) was formed. Coalition commanders formed these militia-type units separately in each area; only later were they gradually brought together as one force. There were several instances where they have refused to take military action against fellow Iraqis, such as in Fallujah, deserted, or allegedly aided the resistance. It is alleged that most guardsmen were drawn from the Shia majority in Southern Iraq or the Kurdish majority in northern Iraq, rather than from the Sunni area which they were ordered to attack. In September 2004, a senior member of the National Guard, General Talib al-Lahibi was arrested on suspicion of having links with insurgent groups. In December 2004, it was announced that the Iraqi National Guard would be dissolved. At this time its strength was officially over 40,000 men. Its units became part of the army. The absorption of the ING by the regular army appears to have taken place on January 6, 2005, Iraqi Army Day. On August 14, 2004, the NATO Training Mission - Iraq was established to assist the Iraqi military, including the army. On September 20 the provisional Fallujah Brigade dissolved after being sent in to secure the city. The Fallujah Brigade experiment of using former insurgents to secure a city was not repeated. 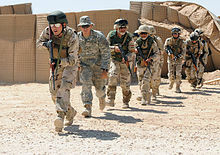 Army training was transferred from Vinnell Corporation to the United States armed forces supported by U.S. allies, and is now done by three Iraqi training battalions. Training was impeded by domestic instability, infiltration by insurgents, and high desertion rates. In June 2005, the partnership between Coalition forces and Iraqi forces has increased due to the growing number of battalions in the Iraqi army, which then stood around 115. Out of this number, it was deemed that 80 of them were able to carry out operations in the field with Coalition support limited to logistics and strategic planning, whilst another 20-30 battalions still needed major Coalition support to carry out their operations. As of October 5, 2005 the Iraqi Army had 90 battalions trained well enough to be "deployed independently", i.e. without the help of others such as the United States. Iraqi commandos training under the supervision of soldiers of the US 82nd Airborne. On May 3, 2006 a significant command-and-control development took place. The Iraqi Army command and control center opened in a ceremony at the Iraqi Ground Forces Command (IFGC) headquarters at Camp Victory. The IGFC was established to exercise command and control of assigned Iraqi Army forces and, upon assuming Operational Control, to plan and direct operations to defeat the Iraqi insurgency. At the time, the IFGC was commanded by Lt. Gen. Abdul-Qadar. In 2006 the ten planned divisions began to be certified and assume battlespace responsibility: the 6th and 8th before June 26, 2006, the 9th on June 26, 2006, the 5th on July 3, 2006, the 4th on August 8, 2006, and the 2nd on December 21, 2006. After divisions were certified, they began to be transferred from U.S. operational control to Iraqi control of the IGFC. The 8th Division was transferred on September 7, 2006, and the 3rd Division on December 1, 2006. Another unspecified division also was transferred to IGFC control. Also transferred to the Iraqi chain of command were smaller logistics units: on November 1, 2006, the 5th Motor Transport Regiment (MTR) was the fifth of nine MTRs to be transferred to the Iraqi Army divisions. 2007 plans included, MNF-I said, great efforts to make the Iraqi Army able to sustain itself logistically. As of June 26, 2006, three Iraqi divisions, 18 brigades and 69 battalions were in control of battlespace (including two police commando battalions). Members of Iraqi Army 3rd Brigade, 14th Division participate in a parade for Iraqi and Coalition military members attending the graduation ceremony, February 13. On March 25, 2008, the Iraqi Army launched its first solely planned and executed high-profile division-level operation, Operation Charge of the Knights in Basra. They received Multi-National Force – Iraq support only in air support, logistics and via embedded advisors. Also, a British infantry brigade, part of Multi-National Division South-East, and stationed in Basra, were ready in a tactical overwatch role. Their participation was limited to the provision of embedded training teams. In April–June 2008, two brigades of the Iraqi Army 11th Division, supported by US forces, moved into the southern third of Sadr City. They were tasked to stop rocket and mortar attacks on US bases and the Green Zone. Following the Siege of Sadr City—a month of fighting—the Mahdi Army agreed to let Iraqi forces into the remaining portion of the city. On May 20, troops from the Iraqi Army 3rd Brigade of the 1st (Iraqi Reaction Force) Division and a brigade from the 9th Division moved into the northern districts of Sadr City and began clearing operations. In May, Iraqi army forces launched Operation Lion's Roar (later renamed to Operation Mother of Two Springs) in Mosul and surrounding areas of Nineveh Governorate. Iraq became one of the top purchasers of U.S. military equipment with the Iraqi army trading its AK-47 assault rifles for the more accurate U.S. M-16 and M-4 rifles, among other equipment. In June 2008 the army moved troops to the southern Maysan Governorate. Following a four-day amnesty for insurgents to turn over weapons, the Iraqi Army moved into the provincial capital Amarah. Each of the joint and multi-agency operational commands also include the Department of Border Enforcement (DBE), Federal Police, Emergency Police, Oil Police, FPS, etc. in their command as well as Iraqi Army. Karkh Area Command (KAC) – Western Baghdad. Responsible for the Kadhimiyah, Karkh, Mansour, Bayaa, and Doura Security Districts. Rusafa Area Command (RAC) – Eastern Baghdad. Responsible for the Adhamiyah, Rusafa, Sadr City, New Baghdad, and Karadah Security Districts. 6th Motorised Division – Western Baghdad. 9th Armored Division – Taji – Division certified and assumes responsibility of the battle space of the northern Baghdad Governorate on June 26, 2006. 11th Infantry Division – East Baghdad (probably planned to become a mechanized division). 17th Commando Division – HQ Mahmadiyah The 17th Division commander has been reported as Staff Maj. Gen. Ali Jassam Mohammad. 25th Commando Brigade – 'Baghdad Eagles' – former 4th Bde, 6th Div. Has received commando training by U.S. Special Forces and air assault training. 4th Motorised Division – Tikrit – Division certified on August 8, 2006. 5th Infantry Division (Iron) – Diyala Governorate – Division certified on July 3, 2006. 12th Motorized Division – Tikrit – split off from 4 Div in mid-2008. 7th Infantry Division – Ramadi, West Al Anbar Province – transferred to Iraqi Ground Forces Command on November 1, 2007. In summer 2014, large elements of the Iraqi army were routed by a much smaller and less well-equipped force from the Islamic State. Budget problems continued to hinder the manning of combat support and combat service support units. The lack of soldiers entering boot camp is forcing Iraqi leaders at all levels to face the dual challenge of manning and training enabler units out of existing manpower. In the 2015 Pentagon budget, a further $1.3 billion has been requested to provide weapons for the Iraqi Army. However, the New York Times reported that "some of the weaponry recently supplied by the army has already ended up on the black market and in the hands of Islamic State fighters". The same November 2014 article contended that corruption is endemic in the Iraqi Army. It quoted Col. Shaaban al-Obeidi of the internal security forces, who told the paper's David D Kirkpatrick: "Corruption is everywhere." The article claimed that one Iraqi general is known as "chicken guy" because of his reputation for selling the soldiers' poultry provisions. Divisions are forming engineer, logistics, mortar, and other units by identifying over-strength units, such as the Intelligence, Surveillance, and Reconnaissance (ISR) battalions and other headquarters elements, and then transferring them as needed. Problems include infiltration and an insufficient US advisory effort. The new army aimed to exclude recruits that are former regime security and intelligence organizations members, personnel of the Special Republican Guard, top-level Ba'ath Party members, and Ba'ath Party security and militia organizations. However the army is widely known to have been infiltrated by a multitude of groups ranging from local militias to foreign insurgents. This has led to highly publicized deaths and compromised operations. The Iraqi Special Operations Forces are a Ministry of Defence (Iraq) funded component that reports directly to the Prime Minister of Iraq. In late June 2014, after the large-scale Islamic State of Iraq and the Levant offensive in the north of Iraq, it was reported that ISIL ""took the weapons stores of the 2nd and 3rd [Iraqi army] divisions in Mosul, the 4th division in Salah al Din, the 12th division in the areas near Kirkuk, and another division in Diyala," said Jabbar Yawar, secretary-general of the Kurkish Ministry of Peshmerga Affairs. Reuters reported that the 5th Division (Iraq), located in Diyala Governorate, was by October 2014 reporting to informal "militias' chain of command," not to the Iraqi Army, according to several U.S. and coalition military officials. A much later report from Small Wars Journal said that in "..2013 and 2014 the 7th Division of the Iraqi Army, 99% Sunni, fought IS virtually alone, until it was almost completely destroyed." The October 2014 Reuters report quoted Lieutenant General Mick Bednarek, Chief of the Office of Security Cooperation, in Iraq from 2013 until July 2014, as estimating that "the army has only five functioning divisions ... whose fighting readiness ranges between 60 and 65 percent." Michael Knights wrote in 2016 that the rebuilding from the mid-2014 disaster had been steady but "very slow". "By January 2015 a fair number of brigades had been salvaged and a couple of new brigades were built but the overall frontline combat strength of the ISF was halved due to attrition in the manning of each brigade. [U]nits were weaker and many were too demoralized or lightly equipped to do more than hold in place. A year later, by January 2016, significant progress has been made in terms of available forces albeit largely by shuffling around personnel and raising around a dozen new and very small 1,000-strong brigades." The new 15th and 16th Divisions have been identified, which appear to comprise some of the new brigades that Knights mentions, including the 71st, 72nd, 73rd, 75th, and 76th. The Institute for the Study of War said in their 29 December 2014 situation report that "..The 19th Division is a new military formation intended to include members from the 2nd, 3rd, 4th, and 12th IA divisions that melted away during the rapid advance of ISIS in June of 2014. This formation will almost certainly include volunteer fighters, most likely displaced persons from Mosul, who reside in refugee camps. The.. sectarian composition of the unit will be important to watch. The formation of the division was initially proposed by Defense Minister Khaled al-Obaidi on November 4, 2014 during a visit to Iraqi Kurdistan. During that visit he requested assistance from the Kurdistan Regional Government [with] basing the new division in Iraqi Kurdistan and giving the force responsibility for clearing Mosul." The Iraqi Army began the Anglo-Iraqi War with a force of four divisions. A fifth was formed in 1959. By the outbreak of the Iran–Iraq War, the force had grown to nine divisions. By 1990, with wartime expansion, the force had grown greatly to at least 56 divisions, making the Iraqi army the fourth largest army in the world and one of the strongest in the Middle East. After the defeat in the Persian Gulf War in 1991, force size dropped to around 23 divisions, as well as Republican Guard formations. The new army formed after 2003 was initially planned to be three divisions strong, but was then raised to ten divisions, and the force is now expected to grow to 20 divisions. The U.S. House Armed Services Committee commented in 2007 that "It is important to note that in the initial fielding plan, five army divisions would be tied to the regions from where they were recruited and the other five would be deployable throughout Iraq. This was partially due to the legacy of some army divisions being formed from the National Guard units and has caused some complications in terms of making these forces available for operations in all areas of Iraq, and the military becoming a truly national, non-sectarian force." According to the United States Department of Defense Measuring Safety and Security in Iraq report of August 2006, plans at that time called for the Iraqi Army to be built up to an approximately 300,000-person force. This was based around an Army with 10 infantry divisions and 6 mechanised infantry division consisting of 36 brigades and 113 battalions (91 infantry, 12 special forces, 24 mechanised infantry, 60 armored battalions, 1 security). Nine Motorized Transportation Regiments, 5 logistics battalions, 2 support battalions, 5 Regional Support Units (RSUs), and 91 Garrison Support Units (GSUs) are intended to provide logistics and support for each division, with Taji National Depot providing depot-level maintenance and resupply. Each battalion, brigade, and division headquarters will be supported by a Headquarters and Service Company (HSC) providing logistical and maintenance support to its parent organisation. The army will also include 17 SIBs and a Special Operations Forces Brigade consisting of two special operational battalions. Iraqi T-72s pass in review in Baghdad, June 30, 2009. The Iraqi Army consists of nine regional joint commands. The Joint Operational Commands fall under the command of the National Operations Center. The Iraqi Ground Forces Command does not directly command the army's divisions. As of July 2009, the Iraqi Army had 14 divisions (1st-12th, 14th, and 17th, the designation 13 not being used), containing 56 brigades or 185 combat battalions. The 6th Division and the 17th Division are still missing their fourth manoeuvre brigades. By April 2010, the combat battalion total had risen to 197 combat battalions. Each division has four line brigades, an engineering regiment, and a support regiment. Three of the 56 brigades are not Iraqi Ground Forces Command combatant brigades and are not assigned to a division. They are the Baghdad Brigade formed in the fall of 2008, the 1st Presidential Brigade formed in January 2008, and the 2nd Presidential Brigade formed in the spring of 2009. Iraqi soldiers perform a live-fire exercise using Bulgarian AR-M1 rifles. A female iraqi soldier during live weapons training at the Jordanian Royal Military Academy. An Iraqi Army T-72 tank performs a live-fire training exercise at the Besmaya Gunnery Range, in Besmaya, Baghdad, 28 October 2008. There are three levels of troop capability in the new army: one, two, and three. Level three refers to troops that have just completed basic training, level two refers to troops that are able to work with soldiers, and level one refers to troops that can work by themselves. Members of NATO Training Mission – Iraq (NTM-I) opened a Joint Staff College in ar Rustamiyah in Baghdad on September 27, 2005 with 300 trainers. Training at bases in Norway, Italy, Jordan, Germany, and Egypt has also taken place and 16 NATO countries have allocated forces to the training effort. The Multi-National Force Iraq has also conducted a variety of training programs for both enlisted soldiers and officers including training as medics, engineers, quartermasters, and military police. Beyond the various courses and programs being held in-country, both American staff colleges and military academies have begun taking Iraqi applicants, with Iraqi cadets being enrolled at both the United States Military Academy and the US Air Force Academy. Iraqi Army recruits undergo a standard eight-week  basic training course that includes basic soldiering skills, weapons marksmanship and individual tactics. Former soldiers are eligible for an abbreviated three-week "Direct Recruit Replacement Training" course designed to replace regular basic training to be followed by more training once they have been assigned to a unit. Soldiers later go on to enroll in more specific advanced courses targeted for their respective fields. This could involve going to the Military Intelligence School, the Signal School, the Bomb Disposal School, the Combat Arms Branch School, the Engineer School, and the Military Police School. The Iraqi Armed Service and Supply Institute located in Taji plays a significant role in training aspiring Iraqi non-commissioned officers and commissioned officers. The training is based on a Sandhurst model, chosen in part due to its shorter graduation time compared to West Point. Much of the Iraqi officer training programme is copied directly from the Sandhurst course. CMATT's main recruiting stations are located in Baghdad, Basra and Mosul. The most desired recruits are individuals who have prior military service or are skilled in specific professions such as first aid, heavy equipment operation, food service and truck driving. A recruitment target of approximately one thousand soldiers is desired to eventually form a 757-man battalion. Soldier fallout usually occurs due to voluntary withdrawal or failure to meet training standards. Due to the current demand for these battalions to become active as soon as possible, the first four battalions' officers, non-commissioned officers, and enlisted soldiers are being trained simultaneously (in separate groups). Notable differences in training between CAATT and former training under Saddam's regime include schooling in human rights, the laws of land warfare, and tolerance in a multi-ethnic team. Based on the philosophy used by the U.S. military to boost its own size in response to World War II — that an army can be built faster by focusing on the training on its leadership rather than enlisted soldiers — CMATT has pursued a similar strategy of focusing recruitment and training on commissioned and non-commissioned officers for the remaining 23 Iraqi battalions. Upon successful completion of officer training, these groups of officers will form the battalion's leadership cadre, which will then be responsible for overseeing its own recruitment, training, and readiness of its enlisted men. It is hoped that having the Iraqi leadership train its own will overcome problems faced by CAATT's training process; namely recruitment, desertion, and unit loyalty. All Iraqi Army battalions have embedded U.S. Military transition teams, according to the National Strategy for Victory in Iraq. The MiTTs advise their Iraqi battalions in the areas of intelligence, communications, fire support, logistics and infantry tactics. Larger scale operations are often done jointly with American battalions. This operational training aims to make the battalion self-sustainable tactically, operationally and logistically so that the battalion will be prepared to take over responsibility for battle space. The DOD (as of March '07) reported that 6000 advisors arranged in 480+ teams were embedded with Iraqi units. However, in April, the Congressional Research Service reported that only around 4000 U.S. forces were embedded with Iraqi units at a rate of 10 per battalion. Former U.S. Army analyst Andrew Krepinevich argued that the roughly twelve advisors per Iraqi battalion (approximately 500 troops) is less than half the sufficient amount needed to efficiently implement the combat advisory effort . Krepinevich argues that officers try to avoid taking on advisory tasks due to the US Army's practice of prioritising the promotion of officers that have served with a U.S. unit over ones that have served with foreign forces. Virtually all of the equipment used by the former Iraqi Army was either destroyed by the U.S. and British Forces during the invasion, or was looted during the chaotic aftermath shortly after the fall of the Hussein regime. Four T-55 tanks however have been recovered from an old army base in al-Muqdadiyah and are now in service with the 1st Division. In February 2004 the U.S. government announced that Nour USA was awarded a $327,485,798 contract to procure equipment for both the Iraqi Army and the Iraqi National Guard; however, this contract was canceled in March 2004 when an internal Army investigation (initiated due to complaints from losing bidders) revealed that Army procurement officers in Iraq were violating procedures with sloppy contract language and incomplete paperwork. On May of that same year the U.S. Army Tank-automotive and Armaments Command (TACOM) stated that they would award a contract worth $259,321,656 to ANHAM Joint Venture in exchange for procuring the necessary equipment (and providing its required training) for a minimum of 15 and a maximum of 35 battalions. The minimum bid would begin to be delivered immediately and further orders could be placed until the maximum of 35 battalion sets or September 2006 after the first order was fully delivered. In May 2005, Hungary agreed to donate 77 T-72s to the Iraqi Army, with the refurbishment contract going to Defense Solutions to bring the tanks up to operational status for an estimated 4.5 million dollars US. After a delay in the payment of funds from the Iraqi government, the 9th Mechanised Division received the tanks at its headquarters in Taji over a three-day period starting on November 8, 2005. On July 29, 2005, the United Arab Emirates gained approval to purchase 180 M113A1 APCs in good condition from Switzerland, with the intent to transfer them to Iraq as a gift. Domestic political opposition in Switzerland successfully froze the sale, fearing that the export would violate the country's longstanding tradition of neutrality as well as perhaps make Switzerland a target for terrorism. 173 M113s, 44 APC Talhas, and 100 FV103 Spartans were donated by Jordan, Pakistan and UAE. 600 AMZ Dzik-3 (Ain Jaria) APCs were ordered in Poland (option for 1,200) for delivery by Jan 2007. 573 Otokar Akrep APCs for delivery by Jan 2007. 756 Iraqi Light Armored Vehicles (option for 1,050) for delivery by November 2008. Greece donated 100 BMP-1 to the Iraqi Army. 713 M1114 and 400 M1151 HMMWVs purchased for IA with delivery complete by end July 2006. Serbia has signed a US$230m deal with Iraq to sell weapons and military equipment, the defence ministry said in March 2008. It did not specify the weapons but Serbian military experts believe they include Serbian-made CZ-99 hand guns, Zastava M21 5.56 mm assault rifles, Zastava M84 machine guns, anti-tank weapons (M79 "Osa", Bumbar, and M90 "Strsljen"), ammunition and explosives and about 20 Lasta 95 basic trainer aircraft. Iraq's defence Minister Abdul-Qadir al-Obaidi visited Belgrade in September and November to discuss boosting military ties with Serbia. In August 2008, the United States proposed military sales to Iraq, which will include the latest upgraded M1A1 Abrams battle tanks, attack helicopters, Stryker armored vehicles, modern radios, all to be valued at an estimated $2.16 billion. In December 2008, the United States approved a $6 billion arms deal with Iraq that included 140 M1A1 Abrams tanks and 400 Stryker combat vehicles for elite Iraqi army units. In December 2009, Ukraine has signed a deal to deliver $550 million worth of arms to Iraq, the agreement with the Iraqi ministry of defense calls for Ukraine to produce and deliver 420 BTR-4 armored personnel carriers, six AN-32B military transport planes and other military hardware to Iraq. In February 2009, the US military announced it had struck deals with Iraq that will see Baghdad spend $5 billion on American-made weapons, equipment and training. In 2016, Iraq finalized an order with Uralvagonzavod for 73 T-90S and SK tanks. The T-90SK is a command variant equipped additional radios and navigation equipment. As of 2018, 36 had been delivered and have been assigned to 35th Brigade of the 9th Armored Division. The average Iraqi soldier is equipped with an assortment of uniforms ranging from the Desert Camouflage Uniform, the 6 color "Chocolate Chip" DBDU, the woodland-pattern BDU, the U.S. Marine Corps MARPAT, or Jordanian KA7. Nearly all have a PASGT ballistic helmet, Generation I OTV ballistic vest, and radio. Their light weapons consist of stocks of Cold War-era arms, namely the Tabuk series of Zastava M-70 copies and derivatives like the Tabuk Sniper Rifle, the Russian AKM and the Chinese Type 56 assault rifles, the Zastava M72 and PKM machine guns, and Al-Kadesih sniper rifle though they have received assistance from the U.S. in the form of American-made weapons, including M16A2 and M16A4 rifles and M4 carbines. However weapons registration is poor. A 2006 report by the Special Inspector General for Iraq Reconstruction (SIGIR) notes that out of the 370,000 weapons turned over to the U.S. since the fall of Saddam's regime, only 12,000 serial numbers have been recorded. The lack of proper accounting for these weapons makes the acquisition of small arms by anti-governmental forces such as insurgents or sectarian militias much easier. ^ International Institute for Strategic Studies, The Military Balance 2017, 380. ^ Al-Marashi, Ibrahim; Sammy Salama (2008). Iraq's Armed Forces: An Analytical History. London and New York: Routledge. p. 206. ISBN 0-415-40078-3. Al-Marashi and Salama note that the eighty-third anniversary of Iraqi Army Day was celebrated in 2004. ^ "Measuring Security and Stability in Iraq" (PDF). U.S. Department of Defense. August 2006. p. 52. Archived (PDF) from the original on 2007-09-11. Retrieved 2007-09-07. ^ "The Gulf Military Balance in 2010" (PDF). Center for Strategic and International Studies. 22 April 2010. p. 2. Archived (PDF) from the original on 9 August 2010. Retrieved 3 July 2013. ^ "Iraq Withdrawal: U.S. Abandoning Plans To Keep Troops In Country". The Huffington Post. 15 October 2011. Archived from the original on 30 December 2011. Retrieved 24 June 2013. ^ a b c "Graft Hobbles Iraq's Military In Fighting Isis". The New York Times. 23 November 2014. Archived from the original on 13 October 2017. Retrieved 22 February 2017. ^ S.E. Finer, The Man on Horseback, 1962, 157-8. ^ Kenneth M. Pollack, Arabs at War: Military Effectiveness 1948–91, University of Nebraska Press, Lincoln/London, 2002, p.150, 156. ^ D. Kurzman, Genesis 1948, 1972, p. 382. ^ I. Pappe, The Ethnic Cleansing of Palestine, 2006, p. 129. ^ Solomon (Sawa) Solomon, "The Assyrian Levies, The Final Chapter" Archived 2011-07-22 at the Wayback Machine, Nineveh Magazine 4Q,93, V16, No4. ^ Pollack p.173-5, citing among others Tzvi Ofer, 'The Iraqi Army in the Yom Kippur War,' transl. 'Hatzav,' Tel Aviv: Ma'arachot, 1986, p.128-65. Pollack notes that the various accounts of Iraqi operations on the Golan Heights are highly contradictory. He relies on Ofer, 1986, which is an Israeli General Staff critique of the official Iraqi General Staff analysis of the battle. ^ "Wages of War - Appendix 2: Iraqi Combatant and Noncombatant Fatalities in the 1991 Gulf War". Archived from the original on 2009-04-16. Retrieved 2009-06-20. ^ a b c Malovany, "Wars of Modern Babylon," map, 663. ^ Bremer III, L. Paul (2007-09-06). "How I Didn't Dismantle Iraq's Army". The New York Times. Archived from the original on 2009-04-23. Retrieved 2010-05-04. ^ Rohr, Karl. "Fighting Through the Fog of War". Marine Corps Gazette. Archived from the original on December 1, 2008. Retrieved 29 December 2008. ^ See Gulf War Air Power Survey, Vol. I, pg 68/97. ^ "CNN.com - Iraqi army division gives up fight - Mar. 22, 2003". edition.cnn.com. Archived from the original on 2016-07-10. Retrieved 2018-05-27. ^ Pike, John. "17th Armored Division". www.globalsecurity.org. Archived from the original on 2009-01-09. Retrieved 2010-08-01. ^ "CPA-IRAQ.org: Homepage of The New Iraq - Information about the Iraqi Dinar" (PDF). www.cpa-iraq.org. October 2003. Archived from the original (PDF) on 2004-07-01. Retrieved July 1, 2004. ^ Bing West (7 December 2011). No True Glory: A Frontline Account of the Battle for Fallujah. Random House Publishing Group. p. 118. ISBN 978-0-307-80834-9. Archived from the original on 12 October 2017. Retrieved 10 July 2016. ^ * Zacchea, Michael; Kemp, Ted (2017-04-01). Ragged Edge: A US Marine's Account of Leading the Iraqi Army Fifth Battalion. Chicago Review Press. ISBN 9781613738443. Archived from the original on 2017-10-12. Retrieved 2017-09-01. ^ Kalev Sepp (2005-03-14). "Prepared Statement before the House Subcommittee on National Security, Emerging Threats, and International Relations regarding the training of Iraqi Security Forces" (PDF). Archived from the original (PDF) on May 23, 2005. Retrieved 2008-10-07. ^ Ibrahim Al-Marashi; Sammy Salama (7 April 2008). Iraq's Armed Forces: An Analytical History. Routledge. p. 212. ISBN 978-1-134-14564-5. Archived from the original on 12 October 2017. Retrieved 10 July 2016. ^ "US arrests senior Iraqi commander". BBC. Archived from the original on 31 March 2007. Retrieved 11 October 2014. ^ "Iraq to dissolve National Guard". BBC. Archived from the original on 28 February 2007. Retrieved 11 October 2014. ^ "Iraqi command and control center opens doors amidst turnover of new territory". Multi-National Force – Iraq. 2006-05-04. Archived from the original on 2006-07-08. ^ "US hands over control of Iraq military". Iraq Updates. 7 September 2006. Archived from the original on 16 January 2009. Retrieved 3 January 2018. ^ "US hands over control of Iraq military". www.aljazeera.com. Archived from the original on 2018-01-04. Retrieved 2018-01-03. ^ "Iraqis to Command Four Northern Divisions by February, U.S. General Says". U.S. Department of defense. 1 December 2006. Archived from the original on 30 November 2009. Retrieved 11 October 2014. ^ "Pentagon Press Briefing June 23, 2006, with Secretary Donald Rumsfeld and Gen. George Casey". MNF-I. Archived from the original on 12 January 2009. Retrieved 11 October 2014. ^ "Microsoft Word – OOBpage7-IGFC-B.rtf" (PDF). Archived (PDF) from the original on 2008-02-27. Retrieved 2008-04-05. ^ "The Advisor, MNSTC-I Newsletter, July 8, 2006" (PDF). Archived from the original (PDF) on 2006-11-12. ^ "Iraqi Bedouins seek role in secure future". 25 January 2010. Retrieved 11 October 2014. ^ ""7th Iraqi Army Division now Controlled by Iraqi Government", MNF-I Press Release November 03 2007". Retrieved 11 October 2014. ^ a b John Pike. "New Iraqi Army (NIA)". Archived from the original on 6 October 2014. Retrieved 11 October 2014. ^ Abdulrahim, Raja (29 June 2014). "ISIS weapons windfall may alter balance in Iraq, Syria conflicts". Los Angeles Times. Archived from the original on 13 October 2017. Retrieved 12 October 2017. ^ Parker, Ned. "Power failure in Iraq as militias outgun state". Reuters. Archived from the original on 2017-10-24. Retrieved 2017-10-12. ^ "The Iraqi Military, The US-led Coalition and the Mosul Operation: The Risk of Snatching Defeat from the Jaws of Victory – Small Wars Journal". smallwarsjournal.com. Archived from the original on 2017-10-13. Retrieved 2017-10-12. ^ Knights, Michael (March 2016). The Future of Iraq's Armed Forces (PDF). Baghdad: Al-Bayan Center for Planning and Studies. p. 22. Archived (PDF) from the original on 2017-09-21. Retrieved 2017-10-14. ^ "Iraq Situation Report: January 1-2, 2015" (PDF). Institute for the Study of War. Archived (PDF) from the original on 2016-03-03. ^ House Armed Services Committee, "THE CONTINUING CHALLENGE OF BUILDING THE IRAQI SECURITY FORCES (note 53, page 120)" (PDF). 27 June 2007. Archived from the original (PDF) on 27 June 2007. ^ "United States Department of Defense" (PDF). www.defenselink.mil. Archived (PDF) from the original on 2007-09-11. Retrieved 2007-09-07. ^ "Iraq's T-72s: Payment Received". Archived from the original on 2006-04-04. Retrieved 2007-09-07. ^ "Global MRAP: The International Light Armored Vehicle". Archived from the original on 2012-10-19. Retrieved 2012-09-25. ^ "Armor: Cougars Cousin Badger Arrives in Baghdad". www.strategypage.com. Archived from the original on 2013-01-21. Retrieved 2012-09-25. ^ Foss, Christopher (2008-08-12). "Iraq orders Abrams tanks through US FMS programme". Jane's. Archived from the original on 2008-09-13. Retrieved 2008-10-07. Michael Zacchea and Ted Kemp, The Ragged Edge: A US Marine's Account of Leading the Iraqi Army Fifth Battalion. Chicago Review Press. 2017. ISBN 9781613738443. Kevin M. Woods, Williamson Murray, and Thomas Holaday, with Mounir Elkhamri, 'Saddam's War: An Iraqi military perspective of the Iran–Iraq War,' McNair Papers 70, INSS/NDU, Washington DC, 2009. Wikimedia Commons has media related to Army of Iraq.